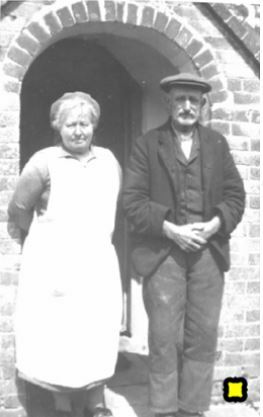 Matthew Langrish Charles (1866-1939) and his wife Susan Priscilla Charles (1877-1947) (pictured below) were the tenants in the 1920s and probably earlier. Aunt Sue was a Balson from the hamlet of Whiteway. 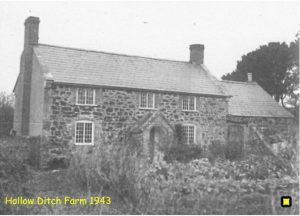 She had married Uncle Mat at Tyneham in July 1913, when she was 26, over twenty years younger than him. 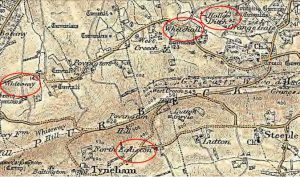 In the 1891 census Matthew was living at Egglestone (Egliston) with his parents William & Emma Charles. Matthew was recorded as an Agricultural Labourer and his father as a Shepherd; in 1901 Matthew was still there but described as a Carter. By 1911 he was living at Hollow Ditch with his father, and was recorded as an ‘Estate Labourer’. My father, Gerald Charles Martin, was born at Whiteway in 1916. His Dorchester born father, Alma Victor Martin, was killed on 18 November 1916 in the Battle of Ancre, the last day of the Battle of the Somme. His mother Edith Ellen Martin (neé Balson), Susan’s sister, contracted TB and was sent to the Sanatorium at Poole. 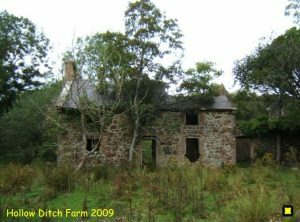 As she was unable to look after her little boy he was sent to Hollow Ditch; a rather lonely boy as there were no other children, though the Cake family were at the nearby Whitehall Farm. He seems not to have been formally adopted. My father and mother met when she was ‘in service’ at Grange House, then just about the only opportunity for a working class girl. When they married in 1936 Mat and Sue bought them a small bungalow at Wool, being a prudent couple they charged the young Martins rent of ten shillings a week – so that the young couple would ‘learn the value of money’. From there Dad could motor cycle to work at Bovington Camp. I was born there later that year. I remember making butter in a small glass churn; now I see the photograph of Sue’s solitary cow I can see why we only made enough for ourselves. Other memories include sorting the stored apples to throw out any that had ‘gone off’ and eating wild strawberries on the banks of Pike’s clay pit railway to their Povington mine. I suffered bad stomach ache after those strawberries! In 2009 I contacted the military at Lulworth Camp and they were kind enough to arrange for a Ranger, with a 4×4, to take us where ever we wanted to go. We first headed to Hollow Ditch; I wished that my parents could have seen it once more, but it is now a sad sight. There were no strawberries to be seen, but there was still fruit in the orchard. We then went to Whiteway, but there is even less there. What came to mind at both sites were the ‘then and now’ photographs of Normandy, with the buildings all rebuilt: and the similar devastation at the South Georgian whaling stations, where I also took many photographs. This was a sturdy little house with little windows and thick walls. Large cupboards by the fireplace house hams and smoked bacon. Breakfast there were marvellous meals – my aunt and uncle having done hours of work fetching the cows and milking by hand, had by this time developed large appetites. Hence we had masses of eggs, thick slices of bacon and chitterlings and soft potato cakes. Sometimes they cooked eels which cousin Gerald had teased me with early in the morning. Mother’s name was Beatrice Bessie Balson, and you can imagine how she was teased about that. Her sister, Susan, who lived at Hollow Ditch, married Matthew Charles.